Trailhead is at the end of Summit Drive in New Boston, NH. To get there, take Meadow Road from the east side of Rt. 13, 3.8 miles north of the center of Mont Vernon. Drive 0.8 miles to the end of Meadow Road, then turn left onto Joe English Road. Continue another 0.8 miles, then turn right onto McCurdy Road. Drive 0.7 miles, then take a right onto Summit Drive. Continue 0.5 miles to the end of the road and park in the cul-de-sac. Although very small in elevation, Joe English Hill stands out from its low, flat surroundings in southern New Hampshire and is often identified along with the Uncanoonucs when seen from afar. Joe English is notable for its nearly cliff-faced southern slope, which provides several of its best viewpoints. Despite being an excellent short hike with good views and easy access, it remains relatively obscure to hikers, overshadowed by more popular destinations in the region. This is due to confusion about access and the lack of any official trail. Follow our directions carefully and you will have no trouble reaching this delightful place. From the cul-de-sac, proceed straight along the edge of a pond on the gravel extension of the road. After just over 0.1 miles, fork left onto a narrower path as the road bears right to a driveway. This path climbs through the forest over a few rocky areas for 0.2 miles, then ends at a gravel clearing with several junk piles. The original road comes in on the opposite side of the clearing. Turn left and continue on the gravel road. The road climbs moderately, then becomes steeper. Paths diverge in several places; stay straight on the main path. There are slight views back over the path to the north as you climb. In just over 0.1 miles, the gravel road abruptly ends and becomes a footpath through very open, gently sloping forest. After 0.2 miles, the path reaches the first viewpoint, which looks to the west and takes in Crotched Mountain. The path crests the broad summit area of Joe English and intersects a yellow-blazed trail which bizarrely begins at an inaccessible point on the other side of the hill. Turn right onto this mysterious trail for another viewpoint. 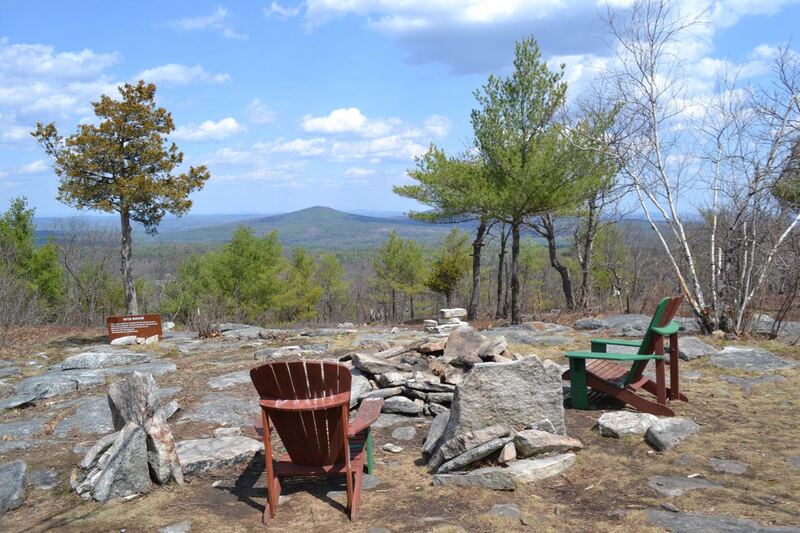 This vista looks southwest to the Wapack Range and Mt. Monadnock. This area is quite ledgy. Continue on the yellow trail as it heads across the west side of the summit plateau through the pleasantly open forest. Just as it leaves the ledgy area, it passes two beaten paths; the first one is on the right, is somewhat hard to follow, and leads 0.2 miles to a good viewpoint over a large field and several houses (not included in the trip distance). The second path leaves on the left; take note of this one for later. For now, continue on the yellow trail as it heads straight for the cliff-faced south slope. In just under 0.2 miles, the path appears to end, but drops down onto a ledgy perch with a sweeping view over the flat countryside. Several marshes add color to the view, as well as the giant white spheres of the New Boston Tracking Station. To the far left, you can see the Uncanoonuc Mountains. This viewpoint appears to be the most open vista on Joe English Hill. When you are finished enjoying this beautiful view, return the way you came to the previously mentioned path and turn right, following it a short distance to an intersection. Turn right and proceed to a small clearing. Straight ahead, the path continues over the true summit and drops to another ledge outcrop, similar to the one reached by the yellow trail (not included in the trip distance). Turn left and continue past a diverging path on the right, reaching the yellow trail on the opposite side of the summit. To the right, the yellow trail descends to its mysteriously inaccessible trailhead. Turn left and take a few steps out into a rocky clearing with lawn chairs set up for raptor migration viewing. This viewpoint provides an excellent look at the Uncanoonucs. To complete the loop, continue along the yellow trail 0.1 miles back to the junction with the trail you ascended. You may now return the way you came.